In 2005–2007 and 2014–2016, a survey was conducted in the southern Golan Heights (License Nos. G-72/2005, G-71/2006, G-74/2006, G-75/2006, G-82/2007, G-84/2007, G-88/2007, S-515/2014, G-89/2015, S-611/2015, G-61/2016, G-79/2016, G-80/2016, S-673/2016; map ref. 2590–802/7324–513), for the purpose of reconstructing the settlement history in this region at the end of the Second Temple period and in the Mishnaic and Talmudic periods. The survey, performed as part of a study of the territory of Susita in the Roman period, on behalf of Bar Ilan University and financed by the Institute of Archaeology at Bar Ilan University, Koschitzky Fund, Krauthammer Cathedra and Moskowitz Cathedra, was directed by S. Fridman (pottery reading), with the assistance of D. Adan-Bayewitz and H. Ben-David (scientific guidance), D. Amit and B. Zissu (identification of stone vessels), Y. Dray (metal detection and cleaning of coins), D.T. Ariel (numismatics), M. Eisenberg and A. Karasik (pottery drawing) and N. Katsnelson (glass). Students from the Kinneret College and Bar-Ilan University, together with pupils from the religious high school in Haspin, participated in the survey. The survey area roughly overlaps the territory of ancient Susita (Tosefta, Sheviʽit 4:10; Jerusalem Talmud, Demai 2:1 p. 24, 74; also mentioned in the Rehov inscription) and is delimited in the west by the Sea of ​​Galilee, in the south and east by the slopes descending from the Golan Heights toward the Yarmuk and Roqad rivers, in the north by the northern bank of Nahal Samakh and Lawiyye Spur, and in the east by the line of settlements formed by Natur, Haspin and Ramat Magshimim. The geographical, geological and morphological characteristics of the southern Golan, as well as the nature of the ancient settlement in this area, divide the region into five sub-units: the Nahal Samakh and Nahal El-‘Al basin (c. 36.5 sq km), the southern Golan Heights (c. 112 sq km), the western and southern slopes and Nahal ʽEn Gev (c. 46.5 sq km), the Nahal Mezar basin (c. 17 sq km) and the eastern slopes (c. 7.5 sq km). Three survey methods were employed: a ground survey, carried out on foot; trial excavations, or shovel tests; and metal detection. The ground survey—the main method—was employed at all the sites, aiming at a highly reliable picture of the regional settlement history and estimations of changes in the size of sites over time based on a statistical analysis of the quantity of ceramic finds from the different periods. A sample of at least 100 diagnostic pottery sherds from the Hellenistic–Byzantine periods was collected from each site. The amount of pottery vessels and the architectural finds at each site helped in determining the various settlement types they represented. The survey comprised 98 sites were previous surveys yielded finds from the Hellenistic, Roman and Byzantine periods (Hartal and Ben-Ephraim 2012a; Hartal and Ben-Ephraim 2012b; Hartal and Ben-Ephraim 2012c; Hartal and Ben-Ephraim 2012d; Hartal and Ben-Ephraim 2012e), as well as two new sites; sixty-two of these are settlement sites (Fig. 1). Each of the sub-regions consisted of a variety of settlement types, including villages, hamlets, agricultural farms, fortresses and agricultural installations. In most of the multi-period sites that were inhabited after the Roman or Byzantine period, architectural remains from the earlier periods were in a poor state of preservation; however, such antiquities were considerably better preserved at sites that were abandoned during the Roman period. The findings indicate that the surveyed settlements reached their peak during the Early Roman period (50 BCE–150 CE) or the Middle Roman period (150–250 CE). By the beginning of the Byzantine period (c. 350 CE), only slightly more than half of the settlements of the Roman period remained inhabited; the rest of the settlements were either abandoned or their population had sharply dwindled. Hardly any new settlements were established during the Byzantine period. Chalk vessels (Fig. 2) were found at 13 settlement sites, indicating the presence of a Jewish population in the surveyed area. Some evidence of a pagan population was also discovered, such as a carved basalt head of a horse (length c. 0.35 m; Fig. 3) found at Jidyā(Fig. 1:40). Some 6,600 diagnostic sherds and scores of chalk vessels were gathered during the survey. The identification and dating of the ceramic finds utilized a method similar to the one adopted by Ben-David (2005) and Leibner (2009) and is based on the research of Slane (1997), who studied Eastern Sigillata A ware, including a variety of imported red slipped tableware that was found at Tel Anafa in the late Hellenistic and Early Roman strata; Adan-Bayewitz (1993; 2003), who studied Kefar Hananya ware, comprising domestic utensils—cooking pots, bowls and jugs—from the Galilee, dating from the Roman and early Byzantine periods; and Hayes (1972; 1980), who studied Late Roman Red Ware, including red-slipped tableware found in numerous excavations in the eastern Mediterranean basin. An analysis of the finds according to the aforementioned method showed that most of the Hellenistic-period sites were small—fortresses or single buildings—and only a few of these sites were identified as villages. During the Early Roman period there was a significant increase in the number of small sites, such as hamlets, farmsteads and fortresses. 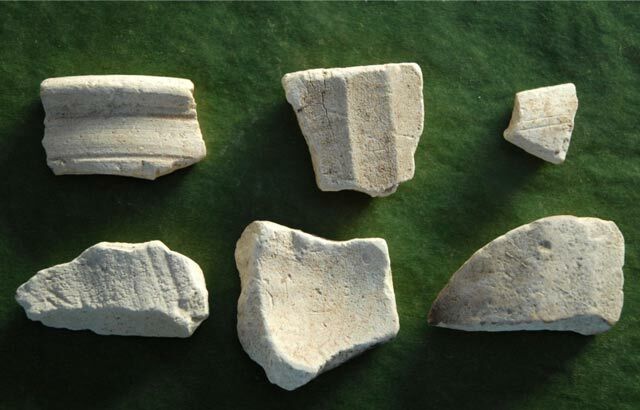 A considerable increase in the quantity of potsherds in the Roman-period sites, both in the small ones and in the villages, was also discerned. Chalk vessels, which are usually dated to the Early Roman period, were found in several of these small sites and villages. The habitation in the area seems to have reached its peak in the Middle Roman period, when the area had the highest number of settlements. In the Late Roman period, the number of inhabited sites declined somewhat. In the early Byzantine period, there was a significant decline in the number of inhabited sites, both the small ones and the villages, and in some villages only few sherds were found. However, the amount of Byzantine-period sherds increased considerably at several of the villages. Shovel tests were conducted at four of the sites—Khirbates-Seybi(Fig. 1:1), el-Mabara (West; Fig. 1:3), Jidyā(Fig. 1:40) and Tel Nov (Fig. 1:41)—to examine the reliability of the historical settlement patterns that emerged from the surface collection of ceramic artifacts. The shovel tests comprised probes identical in size (diam. 1.5 m, depth 0.2 m) that were scattered over as much of the site’s surface as possible. All of the excavated material was sifted. The shovel tests at Khirbat es-Seybi, Tel Nov and Jidyāyielded relatively meager results. However, more finds were discovered at el-Mabara (West). A survey using a metal detector was carried out at twelve sites in hope of collecting coins that would aid in dating the sites, especially the phases when they were abandoned. Approximately 100 coins from the Hellenistic through the Byzantine periods were found. A preliminary examination indicates that the dates of the coins correspond to those of the pottery sherds. Based on the survey finds, consisting of c. 6600 diagnostic pottery sherds, c. 100 coins and scores of stone vessels from the Hellenistic–Byzantine periods, our initial impression is that during the Hellenistic period the population in the southern Golan was sparse and resided mainly in small settlement sites. Villages began to develop in the area in the Early Roman period. During this phase, possibly following Alexander Jannaeus’ military campaigns in Transjordan, Jewish settlements, where chalk vessels were used, were established in the area. The increase in population continued throughout the Middle Roman period, which probably saw the peak of both settlement numbers and population size. During the Late Roman period, the population of the sites declined, and several of them no longer existed. By the end of the Late Roman period and at the beginning of the Byzantine period, dozens of Roman-period sites in the southern Golan, including Jewish ones, were severely reduced in size or ceased to exist. This phenomenon has been observed in other areas in the north of Israel. It does not seem probably that the Jewish settlement disappeared due to some military action or a deliberate ethnic cleansing, since non-Jewish settlements were part of this process. The Byzantine period ushered in another significant decline in the number of inhabited sites in the southern Golan Heights, but the size of ​​the sites where the settlement continued was greatly increased. Ben-David pointed out a similar phenomenon based on the results of his survey in the center of the western Golan Heights. During the Byzantine period, two villages were established in the surveyed area, along the shores of the Sea of Galilee: Khirbat Kursi and Khirbat Duweiraban. Adan-Bayewitz D. 2003. On the Chronology of the Common Pottery of Northern Roman Judaea/Palestine. In G.C. Bottini, L. Di Segni and L.D. Chrupcała eds. One Land—Many Cultures: Archaeological Studies in Honour of Stanislao Loffreda OFM (SBF Collectio Maior 41) Jerusalem. Pp. 5–32. Ben-David C. 2005. The Jewish Settlement on the Golan in the Roman and Byzantine Period. Qazrin (Hebrew). Hartal M. and Ben-Ephraim Y. 2012a. Map of En Gev (40) (Archaeological Survey of Israel). Hartal M. and Ben-Ephraim Y. 2012b. Map of Ma‘ale Gamla (36/1) (Archaeological Survey of Israel). Hartal M. and Ben-Ephraim Y. 2012c. Map of Hammat Gader (44) (Archaeological Survey of Israel). Hartal M. and Ben-Ephraim Y. 2012d. Map of Nov (40/1) (Archaeological Survey of Israel). Hartal M. and Ben-Ephraim Y. 2012e. Map of Rujem el-Hiri (36/2) (Archaeological Survey of Israel). Leibner U. 2009. Settlement and History in Hellenistic, Roman andByzantine Galilee: An Archaeological Survey of the Eastern Galilee (Texts and Studies in Ancient Judaism 127).Tübingen. 1. 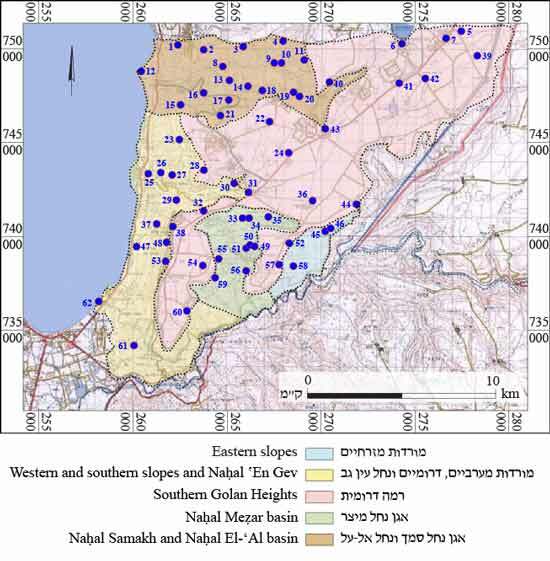 Map of the survey sites in the southern Golan Heights. 2. Stone vessels from sites survey in the southern Golan Heights (scale 1:1). 3. 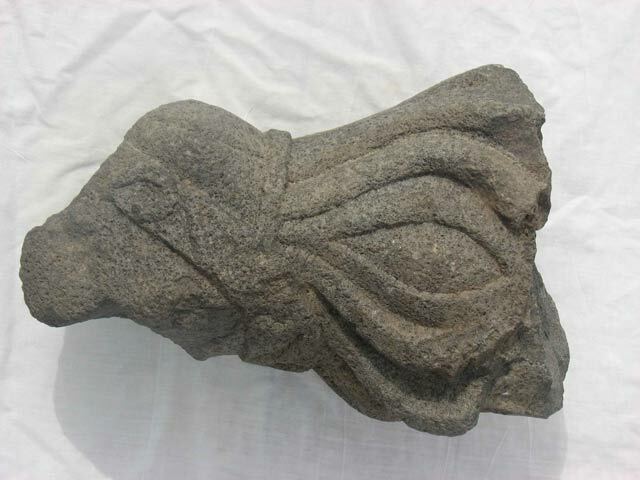 A horse head carved in basalt from Jidyā.